One of the emerging technologies that has the potential to dramatically change the world as we know it, for the good and the bad, is 3D printing. Being able to download product designs from the Internet and manufacture them with your 3D printer is an exciting thought, the technology still needs to mature but the possibilities are endless. In the news is Have Blue, a hobbyist from the AR-15 forum who has become one of the first people to construct an AR-15 class assault rifle using a 3D printer. Have Blue used 3D CAD files from CNCGunsmith.com to print the gun's lower receiver, the part that in a legal sense actually constitutes a firearm. After making some minor changes to the design, he fed about $30 worth of standard ABS plastic into his fairly old school Stratasys 3D printer and combined the body with off-the-shelf, metal AR-15 parts to complete the gun. Afterwards he loaded the gun with relatively low-powered .22 caliber pistol rounds and after firing 200 rounds he posted online that it runs great, without visible signs of wear and tear. 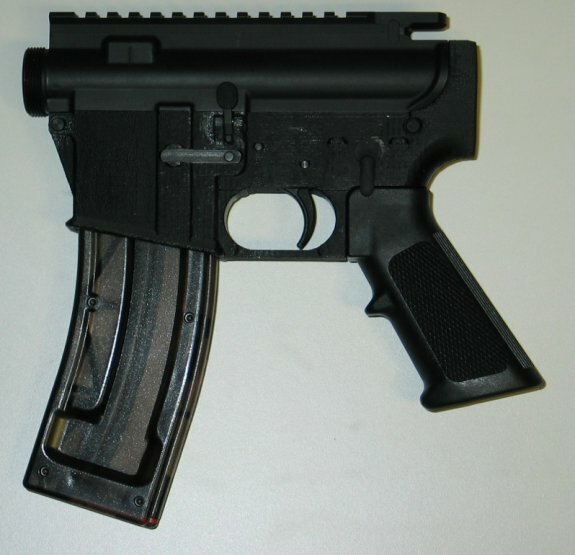 The lower receiver was created using a fairly old school Stratasys 3D printer, using a normal plastic resin. HaveBlue estimates that it cost around $30 of resin to create the lower receiver, but “Makerbots and the other low cost printers exploding onto the market would bring the cost down to perhaps $10.” Commercial, off-the-shelf assault rifle lower receivers are a lot more expensive. If you want to print your own AR-15 lower receiver, HaveBlue has uploaded the schematic to Thingiverse. HaveBlue tried to use the same lower receiver to make a full-blown .223 AR-15/M16 rifle, but it didn’t work. Funnily enough, he thinks the off-the-shelf parts are causing issues, rather than the 3D-printed part. Much more information can be read at Have Blue's website.